The problem is, not all hot pink & clear is made equal. Lucite is crazy expensive, while acrylic and glass offer more affordable alternatives. So I decided to round up some of my faves, and put them in their appropriate economic class bracket based on recent popular socio-political syntax. In the 1%? Perhaps I can interest you in an original Yves Klein Coffee Table, no longer in production and frequently listed for $20,000. Too rich for your blood? Perhaps you find yourself among the 53% that may still command the interest of Mitt Romney... go for an Alexandra Von Furstenberg Desk (price upon request, you know what that means), a hot pair of the Christian Louboutin Illusion Pumps for $795, or this amazing Fiona Kotur Clutch for $395. Still suffering from pricetag shock? Maybe you're in the 47%, or just running low on your hot pink and lucite funds (it happens to the best of us sometimes)... how about this AVF Acrylic Candy Bowl for $178 or this AVF Flower Vase for $268? Still a no? Fear not, 99%! 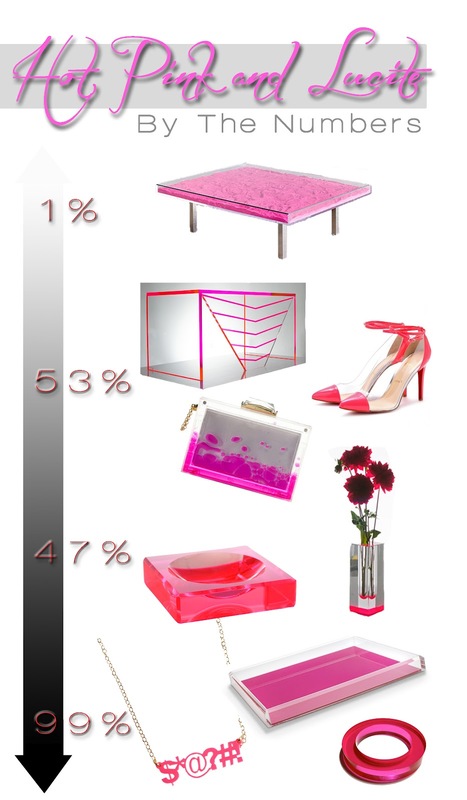 Hot Pink and Lucite is all about equality. Get yourself the Oops She Did It Again Necklace for $48, a Lucite Tray from C Wonder for $98 or a Vintage Lucite Bracelet from Etsy for $38! Now you have no excuse. Riot On!